This entry was posted in Uncategorized on September 2, 2014 by farmgirlsc. On September 17, 2014, I will be making a presentation on Vermiculture for the Fairfield Glade Garden Club, in Fairfield Glade, TN. I will be taking my worm family, all of whom have the name of “Francis”. I am looking forward to the discussion of vermicomposting being shared with people who already have an interest in improving the world around them. Using their kitchen scraps to improve the soil, to improve their gardens. Whether it be flowers or vegetable plants, the addition of castings to the soil, is a healthy way to achieve their goals. Introducing vermiculture leads to a natural discussion of a “whole system” practice, of course, being permaculture. 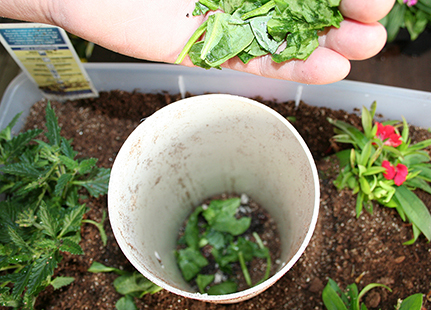 It is easy to explain that vermiculture is one small piece of the larger puzzle. Easy, low maintenance, rewarding ~ sounds like a win-win! This entry was posted in homestead and tagged composting, Eisenia Fetida, environment, healthy, permaculture, permanent agriculture, recycling, red wigglers, vermicomposting, worm castings, worms on August 30, 2014 by farmgirlsc. This entry was posted in Uncategorized on August 30, 2014 by farmgirlsc. Spent the weekend talking with others about Permaculture and Vermiculture. Met a lot of people who are excited about making the world a better place one place at a time. The Master Gardener hosts held a well-organized event. We were able to speak to a group of people interested in the concepts and achievements of Permaculture. We were able to educate people on the value of the small, but exceptionally import red wiggler (Eisenia Fetida). Much to their amazement, many people were unaware the importance of worms in the garden. We were presented with an award for the “Best Educational Exhibit”! Thank you, Master Gardeners for a great opportunity! 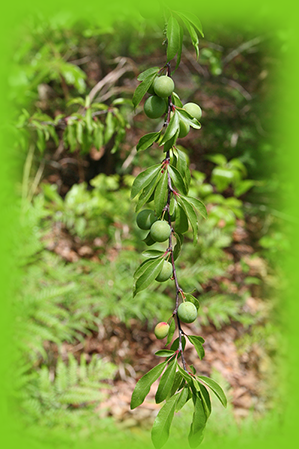 The fruit is just starting to appear in the Permaculture Garden – plums, grapes, blueberries, blackberries. These ripened a few days after this photo – they were small, but sweet. The best part is the satisfaction of knowing you planted it, nurtured it and then tasted it! Yum! Having a friend to share it all with is even better and sweeter!!! Mind you all is not served up without effort – the horseflies were about and other woodland creatures out for their best interest – but hey – all is fair – I’m in their house! Enjoy the goodness the season has to offer – what is your favorite? This entry was posted in Uncategorized on June 14, 2013 by farmgirlsc. This weekend started with a dash to the thrift store to see what pieces were trying to get a new lease on life. A little dragging, scrubbing, painting and un-painting revealed new furniture. Like the new style of jeans that look they are ready to be retired. This furniture ended up looking like the velveteen rabbit, the more worn, the more loved. 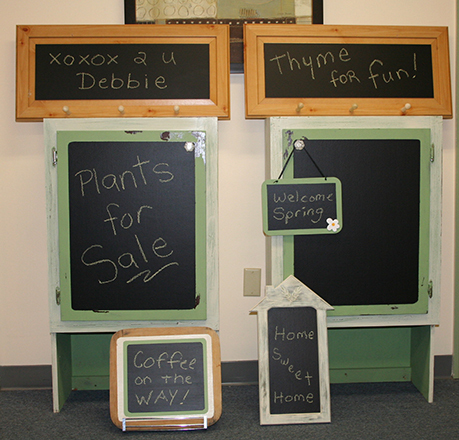 I had wanted to experiment with the “Chalkboard Paint” I had gotten, like all things – theory works better than application. The surface is not smooth enough to suit me – but it is acceptable. The point of the exercise was fun & experimentation. That goal was achieved, so for under $25.00 a weekend of activity was purchased. I am going to place 2 window boxes in each cupboard, one on the top and one on the bottom. Should be cool. I’ll post when done. Let me know your thoughts. This entry was posted in Uncategorized on May 14, 2013 by farmgirlsc. Adventures in painting with Chalkboard paint.